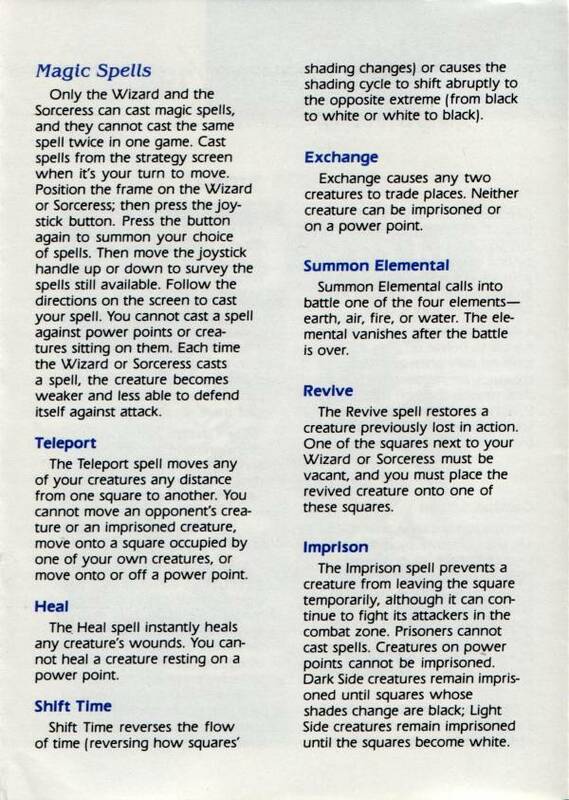 More about Electronic Arts "exploding out of the gate in 1983", I'd like to see Atarimania make a duplicate entry for "Music Construction Set" here in the Games section because when you do searches like on 'music' it doesn't show unless you start from Utilities. Computer opponent was so easy to beat I narrowed the objective to where I had to not loose any pieces and get this, I would have all my pieces arranged in their start position when I won, so it looked like the entire opposing force was swept away at once without me even moving. 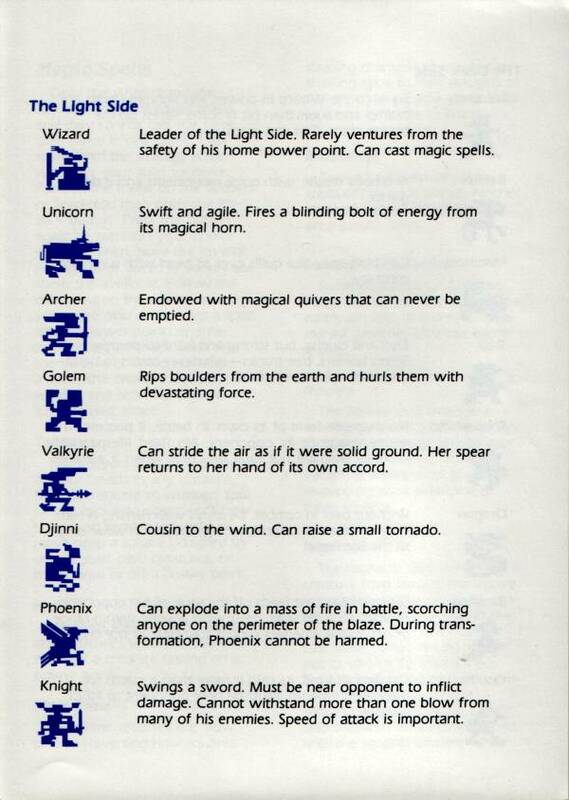 I guess I must have summoned an elemental to complete my trick so as not to end up out of position. Yes one of the Top Ten games. 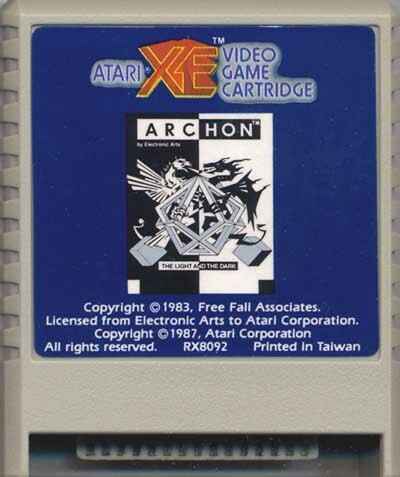 I wrote up an article on game design using Atari 8-bit Archon as my model. Called Digesting Archon. Great game, we played it a lot. Two player was the best. 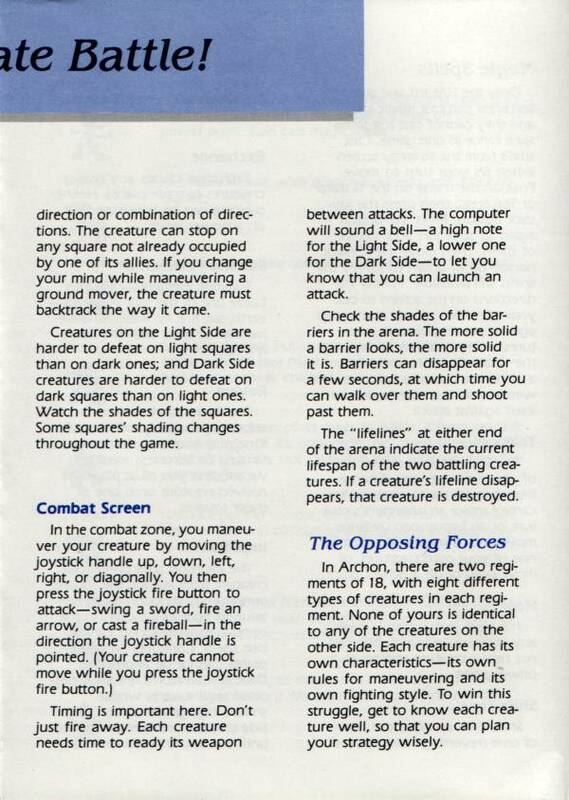 It's amazing how Electronic Arts just exploded out of the gate in 1983. 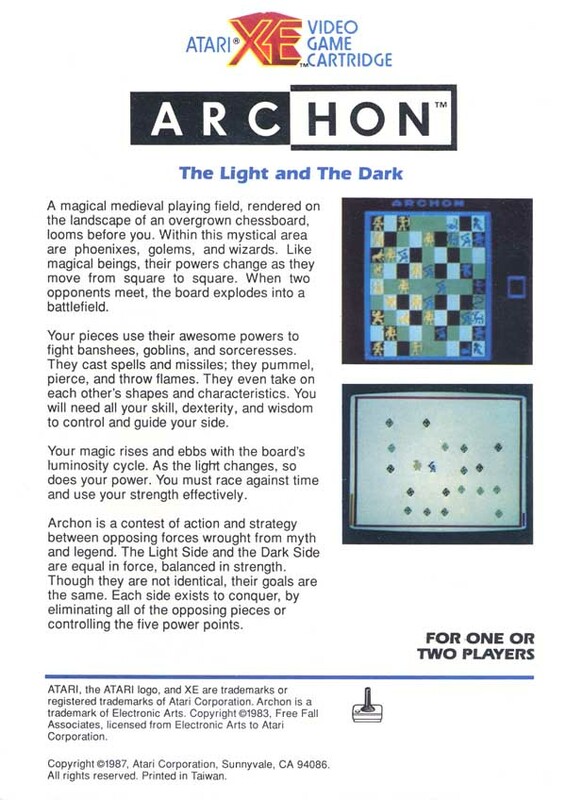 Archon I & II, Murder on the Zinderneuf, MULE, Seven Cities of Gold, One on One, Pinball Construction Set...How I wish EA today could capture just a fraction of that magic. 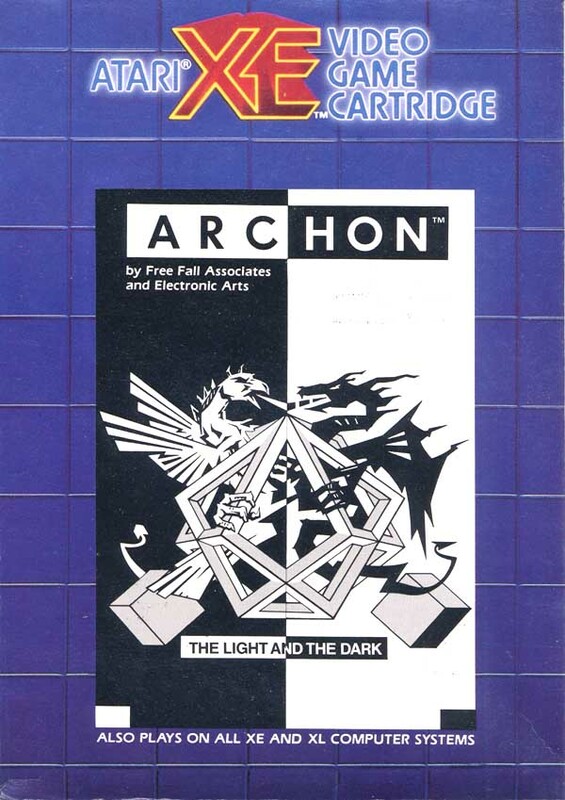 For fans of Archon, you should try the remake Archon Classic on the PC. It has a classic mode that is faithful to the original. It also adds multiple AI levels, and four campaigns, plus lots of other extras. hope to find you there, before the masters intervene, lol. MASTERPIECE. MIND-BLOWING. INFINITELY REPLAYABLE. I wonder how many hours of my life were spent on this one? 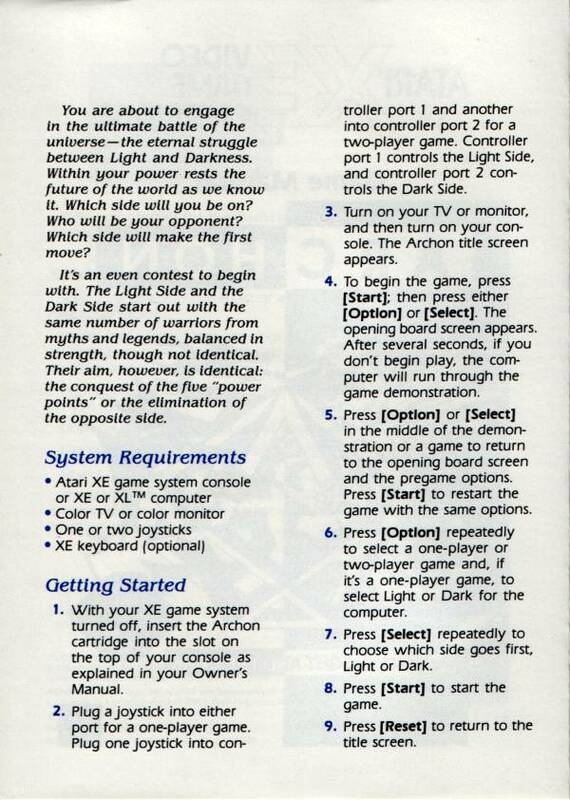 Paul Reiche III made a game called "The Unholy War" in 1998 for the Playstation that is a spiritual successor to Archon. My highest recommendation. 10/10. 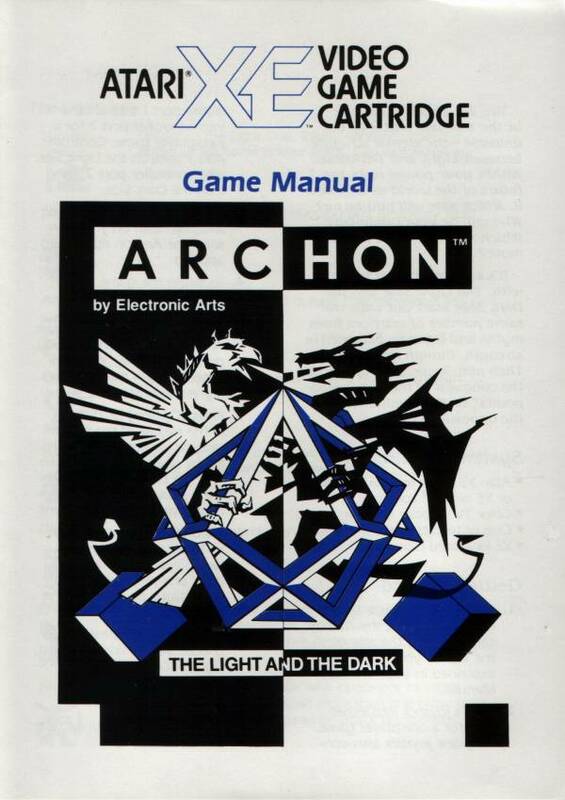 Archon was actually available on diskette. I still own it. It still works. You do have to use Translator though. This was the first disk game I purchased, and remains to this day, one of my favourites. 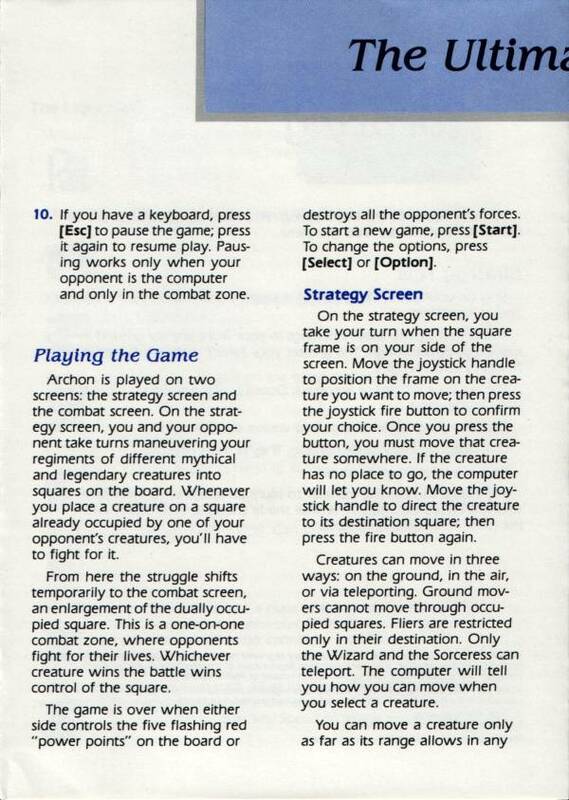 The idea of chess with arcade combat was genius. The computer opponent was a little easy to beat, once you'd worked out each characters strengths and weaknesses, but against a human, this game was utterly fantastic. There is no question that this is one of the 'top ten' for the 8-bitter. It's not often that strategy plus quick eye/hand coordination are fused together with such beauty. 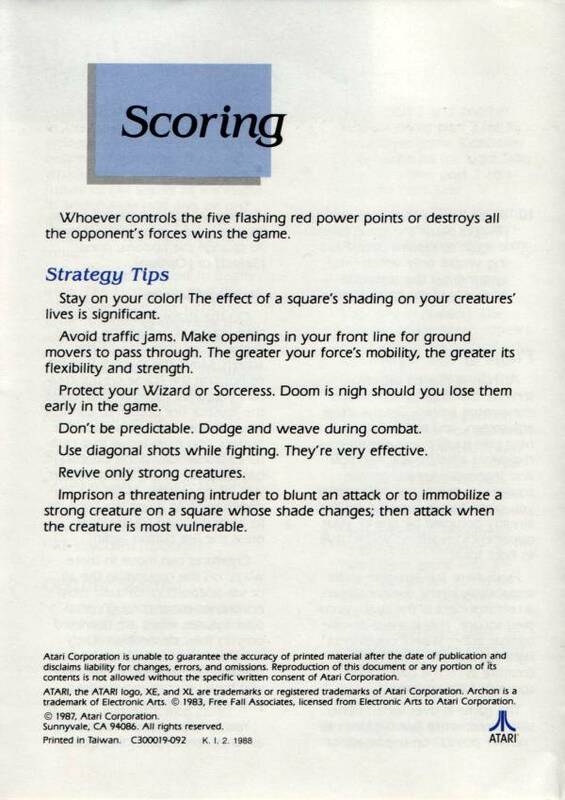 The computer is actually easier to beat than a quick-handed flesh and blood opponent. 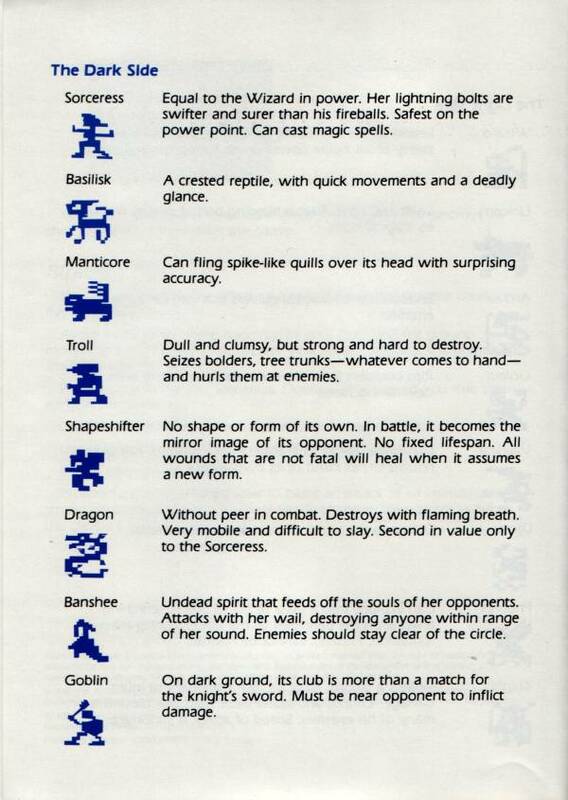 I always hated chess, but this game showed me that chess can live effectively in a new form. A little aside: the game is available not only on disk but cartridge as well. It was 'blue boxed' and still available at a reasonable price on eBay. I still play this one on my old 800 tank, and love it. Great mix of strategy and action. Hard to beat a game like this. This was one of THE classic Atari games that I played over and over again. Many afternoons, after school in the computer lab. Its sequel even pulled in my English teacher for some gameplay. Many thanks to RossPK for scanning the instructions! The forces of Light and Darkness square off in mortal combat in a quest to control an ever-changing playfield in this fascinating contest that borrows elements from sorcery, mythology and chess.